Having released the brilliant debut album last month Science & Magic, Andrew Foster, a very talented singer-songwriter from the South Coast here in the UK has certainly been making his mark by playing a string of shows over the summer. With support slots for James Walsh (Starsailor) and Terry Reid, he has also played the Isle Of Wight Festival, The London Folkfest, Alsager Musical Festival and the O2 Academy 2 in London along with many over local events. 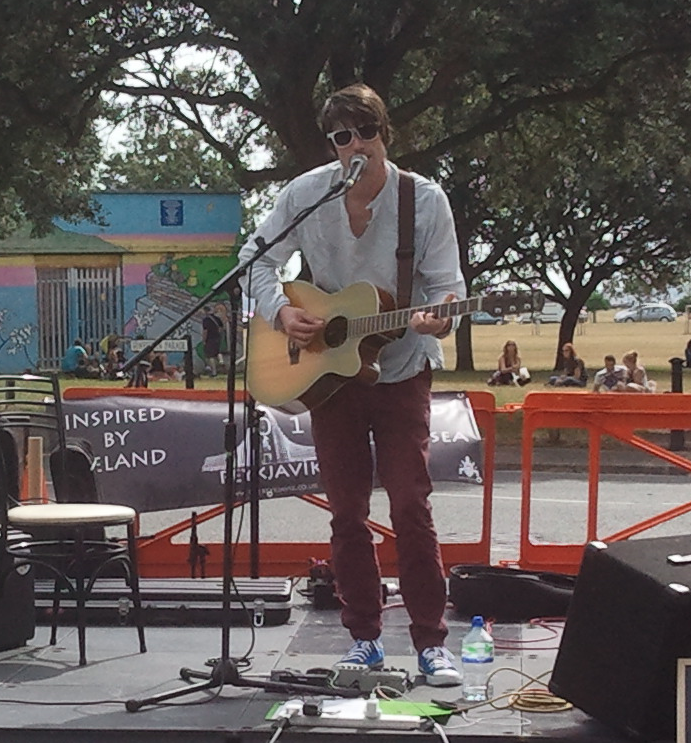 This weekend Andrew Foster played the Castle Road Summer Festival in Southsea, an event celebrating an area with a rich and vibrant history. The India Arms there was a second home to me in my youth so it was nice to revisit and to get the opportunity to see Andrew play again live after buying the stunning album when I last saw him. It’s this kind of event that shows just how talented Andrew is, with just a basic sound system and a guitar, the set is stripped back from the album but still sounds every bit as good live. Treating the audience to a fantastic set starting with The Garden, then onto City Sleep, Heartbeats, Memory Maze, Dreamscape, a Neil Young cover Don’t Let It Bring You Down, Eyes To The Sky and ending on Weird Science, all the songs played very much showcased just how good he is. Next week Andrew is playing at the Ventnor Fringe on the Isle of Wight 13th August, then on to the Wickham Festival on the 15th August, playing alongside artists on the line-up such as James Blunt, The Lightening Seeds, Steve Earle & The Dukes and Bellowhead, before heading to the Victorious Festival in Southsea on 23rd August (I have booked that day) which features a host of diverse artists such as Dizzee Rascal, Seasick Steve, Shed Seven, Razorlight and a particular favourite of mine Mark Morriss (Bluetones), then it will be back to some more live dates once the festival season has finished. Talented and hardworking, he is proving how good he is by playing these events along with those established artists. Despite the array of other artists playing at these events, I can whole-heartedly recommend that the one person to see is Andrew Foster as you won’t be disappointed, having now seen him play live three times this year it is just a fantastic set and this is coming from someone who just doesn’t normally do acoustic sets, being rather more into something a bit more heavier. Once you have heard him live it is also essential that you buy the Science & Magic album because if you thought what he played live was good, the album just takes it to an even higher level of excellence. I really do admire those bands and musicians like Andrew who not only love what they do but also get out there and perform, and us as music fans should show our support of great music by going to see them play live and buying their music. Memory Maze from the album is being featured on BBC Introducing as well so it is great to see that someone with this much talent is finally getting the recognition and airplay they deserve and I doubt it will be very long before Andrew Foster is far more well known. Science & Magic is available on download from iTunes, Spotify and Amazon MP3 or more details from his website if you prefer a CD http://www.andrewfostermusic.co.uk You can also follow Andrew on Facebook or twitter @andyfostermusic for updates.